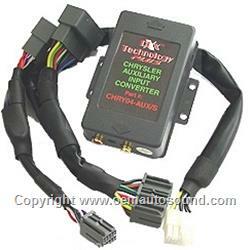 Chrysler, Dodge, Jeep, auxiliary input interface for 2005 to 2007 radios. The CHRY04-AUX/S adapter converts the satellite port of Oem Chrysler radios to RCA level audio input. Has a built-in audio adjustment pot with an input sensitivity range of 0.475 volts to 4.75 volts (peak to peak) allowing the installer to match the audio level of the Aux device to the audio level of the AM, FM, or CD modes of the factory radio.